So, there is a lot of confusion going around as to where the new Picard Series fits in the timeline, and there a lot of confusion if it is in the Kelvin Universe or the Prime Universe and so I am going to do my best to explain the whole situation. I tried making a video guide to this, but I’m terrible with that, and I’m better at writing these things out so let’s just get on with it. The recent article talking about this references a changed Picard after the destruction of Romulus. This takes place in the Prime Timeline during the year 2387. While a specific year is never mentioned, Ambassador Spock talks about this event happening. While the movie itself is kinda shady with details as to when and where this takes place, it has since been established by outside sources, and the creators of the shows that the events that trigger the Kelvin Timeline take place within the Prime Timeline. The singularity which Spock Creates to contain the supernova which destroys Romulus doesn’t JUST take him back in time. It takes him to a whole new reality. Again, the film is kinda shady with this exact detail, but it’s since been established as a separate reality. This isn’t exactly an unusual sight for Star Trek, as the episode “Parallels” (TNG S7, E11) reveals the existence of thousands (probably more) realities coexisting beside what we call the Prime Universe. One of these is the iconic Mirror Universe; a reality which has intertwined with the Prime Universe while existing as its own reality. The Kelvin Universe is very much like any of these other realities. It has been influenced by events of the Prime Universe, but has not altered anything going on in the Prime Universe. To put it simply, the new Picard Show still has Vulcan. Nero’s destruction of Vulcan takes place in a different reality. In the opening segments of one of the comic stories detailing the Kelvin Universe, we actually see Q visit Picard moments after Spock vanishes and talking to him about events that have happened in this “parallel timeline”. You can argue that with it being a comic and not shown onscreen, this isn’t technically canon, but the more and more I read of this show, the more I’m convinced that they’re integrating certain elements of this into this show. 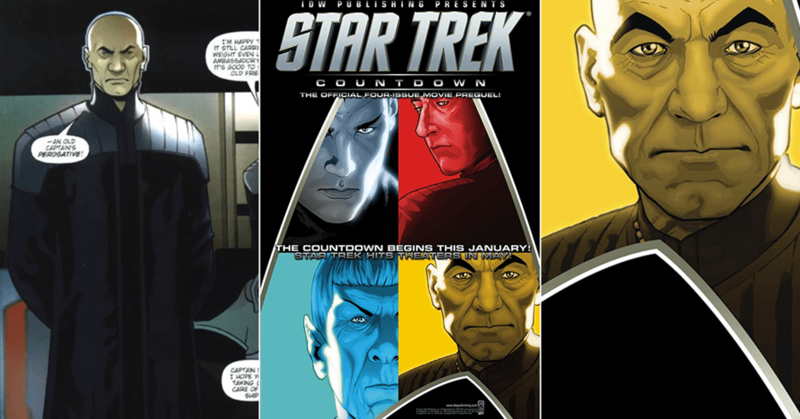 Some recommended reading I have for you all is the comic Star Trek: Countdown, which details the events leading up to the Destruction of Romulus. Here, we see Spock trying to convince Romulus of the imminent danger it is in, and he is helped by none other than Picard, who has a role in this comic as well. He does everything in his power to help Spock with his endeavour, but as we all know, this only results in failure as Romulus is destroyed and Spock disappears. In the comic, Picard presumes him dead. This might be partly why Picard is as changed as he is in the series we will be getting. Another thing to take note of is that the game Star Trek Online takes place about 20 years after the destruction of Romulus. And its story does not focus on events that have taken place within the Kelvin Universe. Vulcan is still there. Romulus however, is destroyed, and the Empire is pretty much gone. Now I know plenty of you are talking about how time travel works and if you change one thing in the past, it alters another thing and so on and so forth, and I’ve seen a lot of references to Back to the Future, and here’s the thing. Back to the Future deals strictly with Time Travel. It doesn’t deal with Parallel Realities, which Star Trek has done numerous times. Yes, Star Trek has done Time Travel before, but it has also bent the rules of time travel time and time again. To put it bluntly, you can’t hold Star Trek to the same set of rules that Back to the Future follows, because the two really don’t have a lot in common. Each series has tackled Time Travel differently with different results. 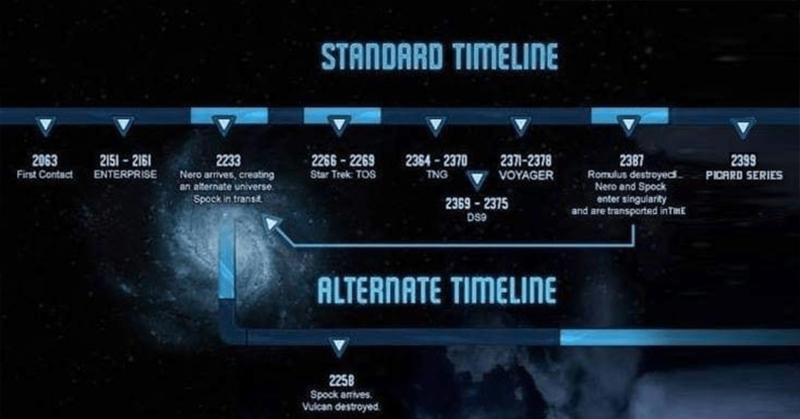 This is a little reference guide of timelines, one from Star Trek Online, the other explaining where Discovery fits in the timeline. The latter of which was officially released by the show’s front-runners. 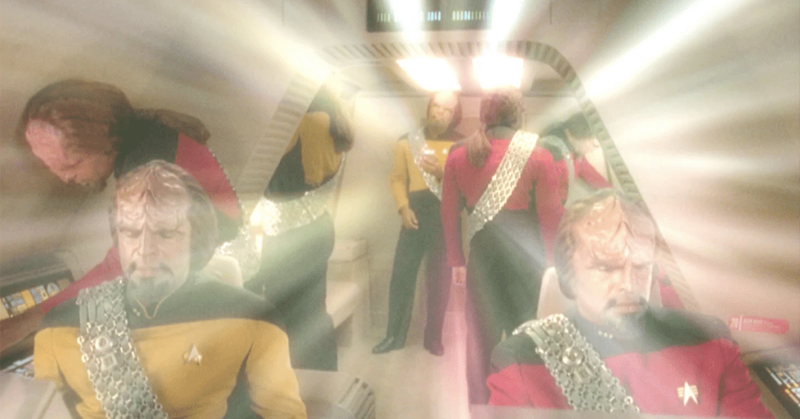 You’ll notice that Discovery takes place AFTER the Narada Incursion into the Kelvin Universe. Everything that happens in that reality is absent from Discovery. And it will be absent in the Picard series. The ONLY thing you need to know about the Picard show that is revealed in the Kelvin movies, is that Romulus has been destroyed, and apparently as a consequence, the Romulan Star Empire has fallen. That doesn’t mean that the Romulans are gone. If anything, we might finally see them as friends to the Federation, similar to how the Klingons allied with the Federation after the disaster on Praxis. But the Empire is gone. Nothing has been erased. Star Trek TOS, the films, TNG, DS9, VOY, they’ve all occurred just as you remember them. A few alternate futures might not have happened the way we would have hoped, but that’s just hardly a first. When you finally see the pilot episode of this new Picard Series, this isn’t the Picard which is the result of a radically different timeline that we’ve seen in the films Star Trek (09), Into Darkness, and Beyond. This is the Picard we grew up watching in seven seasons of TNG, four films, and what has become of him in the events that have happened since then. Again… NOTHING HAS BEEN ERASED.